Mental health is a serious issue that often does not get enough attention in mainstream media. Every single day, people all over the country and the world struggle with mental health issues that often prevent them from living normal lives. This is why May has been deemed Mental Health Month in the United States. During this month, issues like depression, anxiety and more are openly talked about, with the intention of finding a way to provide mental, emotional, and physical support to those who are struggling. At OUR Center, we provide mental health services year round so that anyone in the Longmont area who needs help coping with their issues can have the resources they need to do so. Continue reading below to learn more about how you can find relief from any mental health issues you may be experiencing. In order to understand the severity of mental health issues in this country, let’s take into account some statistics. According to the National Alliance on Mental Illness, the following numbers show the toll that mental health issues and mental illnesses are having on our population in the United States. The biggest problem facing those who try to raise awareness about mental health issues and those who suffer from them is the stigma that has somehow survived over the years. Despite the vast amount of information that has been discovered through studying those with conditions like depression, bipolar disorder and more, mental illness is simply not spoken about nearly as much as it should be. 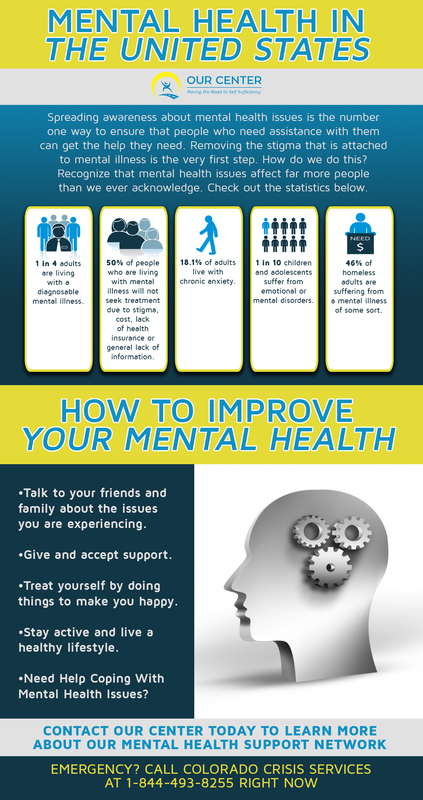 If you think you are suffering from a mental health condition that requires some sort of treatment, there are several things you can do to get the help you need. First, ask your physician if he/she can help you to find a specialist. If you do not have a doctor that you trust, try reaching out to a mental health center in your area to inquire about what services they can offer to you. Make an appointment to talk with a mental health professional. Be sure to learn what your symptoms mean and what your treatment plan will look like so that you can begin to cope with your mental health issue in the most productive way possible. Don’t give up. Treatment is not an overnight process. It takes time and commitment. This means when you feel like it’s not working, you have to continue to do it in order to see results. Keep a log of how you are feeling on a daily basis. This will allow you to understand what sort of things trigger your symptoms to occur. If you ever feel as though you are heading for a breakdown or crisis, be sure to call Colorado Crisis Services at 1-844-493-8255. Here, you can reach therapists and peer counselors at any time of day, any day of the year. Even if you aren’t sure whether your situation is a crisis, call anyway. Your life is important. While it may seem as though many people do not take mental health issues as seriously as they should, there have been major strides made in regards to awareness. Sure, the statistics above may make you feel a bit unsure, but compared to awareness campaigns of the past, we are making more progress than ever. 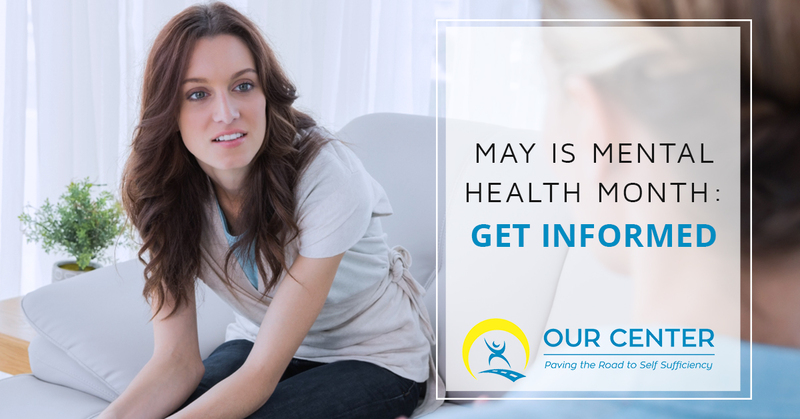 May being Mental Health Month is just one way in which people are working to shine a light on this important topic. If you are facing mental health issues and you need a helping hand, be sure to reach out to the team at OUR Center. We have a strong and confidential support network for those living with mental health conditions who are living in the Longmont area. Give us a call today or request an appointment online. Remember, no matter how hard life gets, there are people who care about you and who will be here for you when you are ready to ask for assistance.